So cute!! I love all the stars!! This is great! I love your fabric and color choices! Fun quilt! Looks like it would be a challenge to make. Beautiful finish. Love the bright colors and those rockets. Such a fun baby quilt. The quilt is so happy, Leann, and I am excited for you to have another pattern release soon. Good luck in the festival! What a fun quilt for a little budding astronaut. 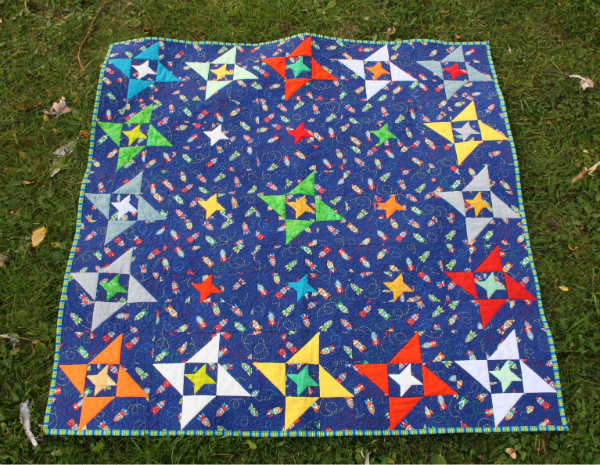 I really like this quilt with the fun stars and background print. Congrats for being close to finishing another pattern! Those little stars really sparkle! A fun twist to the Friendship Star...I love it!